I have never really been much of a ‘foodie’, I always chose grabbing something on the go instead of wasting valuable exploring time sat in a cafe. However during my weekend in Amsterdam, that is exactly what I did. 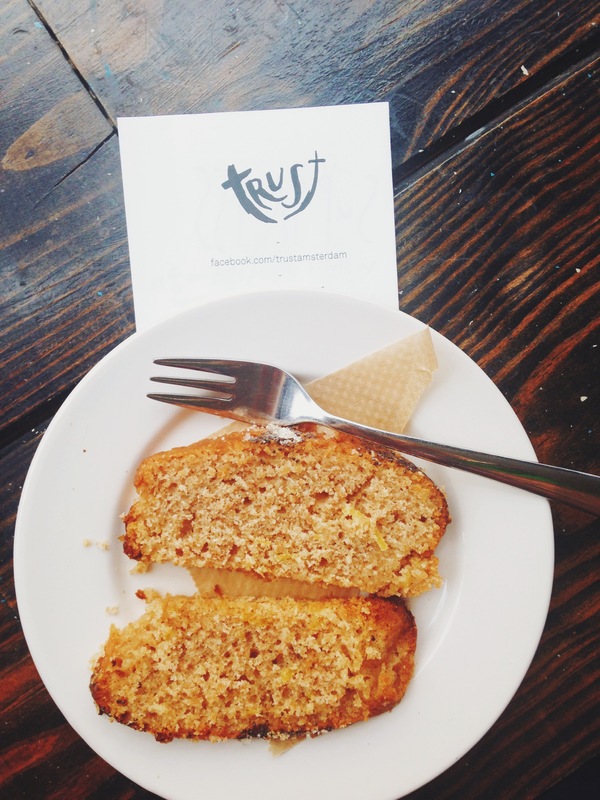 As part of #parkinnexpress challenge we had been asked to find a cafe we could ‘trust’, you’ve guessed it we were looking for a cafe called Trust. 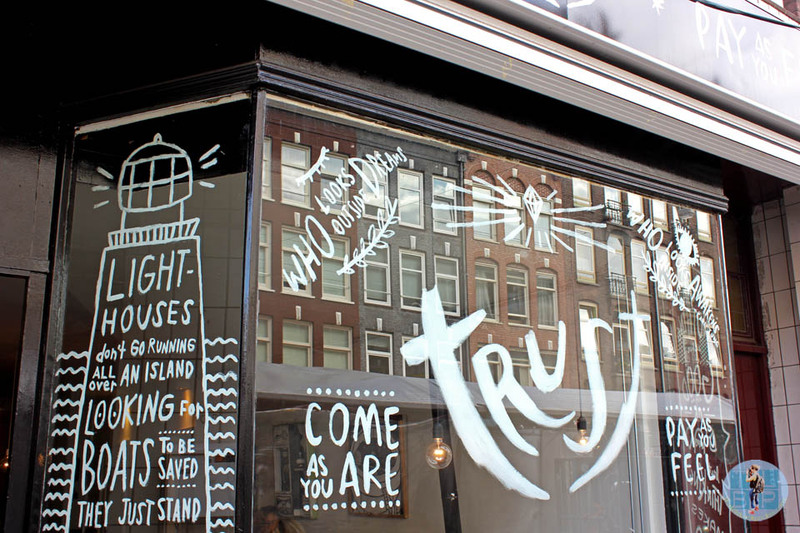 Now Trust isn’t just any old cafe, it is located hidden among the Albert Cuyp Market – somewhere that felt very unknown to tourists. Not only that but it is a place where you only ‘pay as you feel’ your meal was worth. 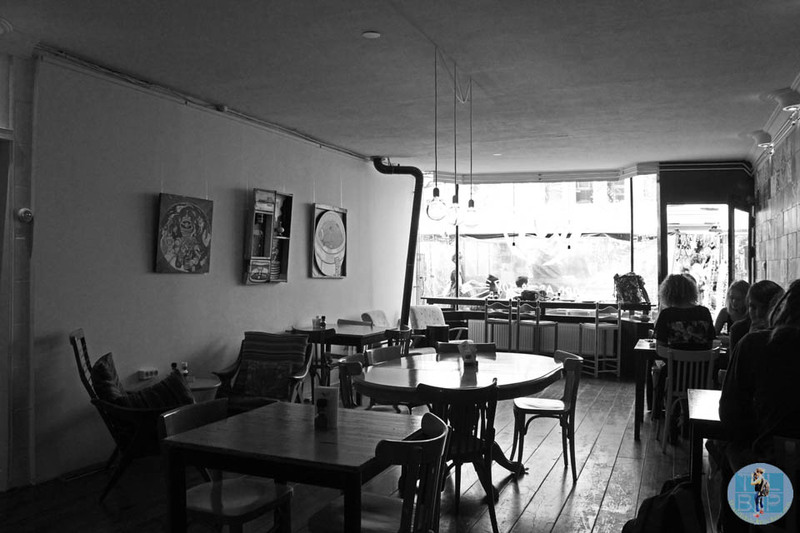 The whole cafe is run by volunteers and ‘they are not about food and coffee, they are about extending love and joy’. Despite this I have to say my coffee and food were delicious, although the portion size was rather small. Still this meant I had room for dessert so wasn’t complaining too much. 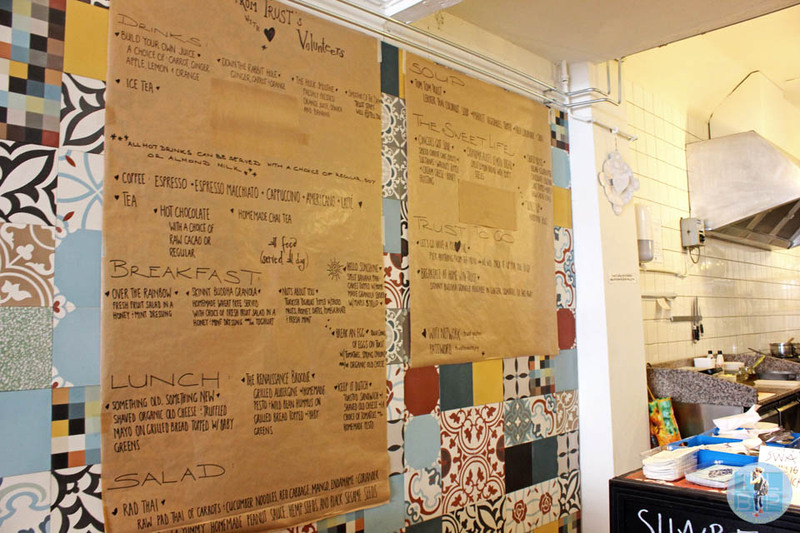 The menu is small but an ever changing affair (depending on the volunteers), it is written up on paper and stuck to the wall, adding to the character this cafe certainly has. The walls are also covered in funky abstract art, the furniture was different for every table and you could see directly in to the kitchen. 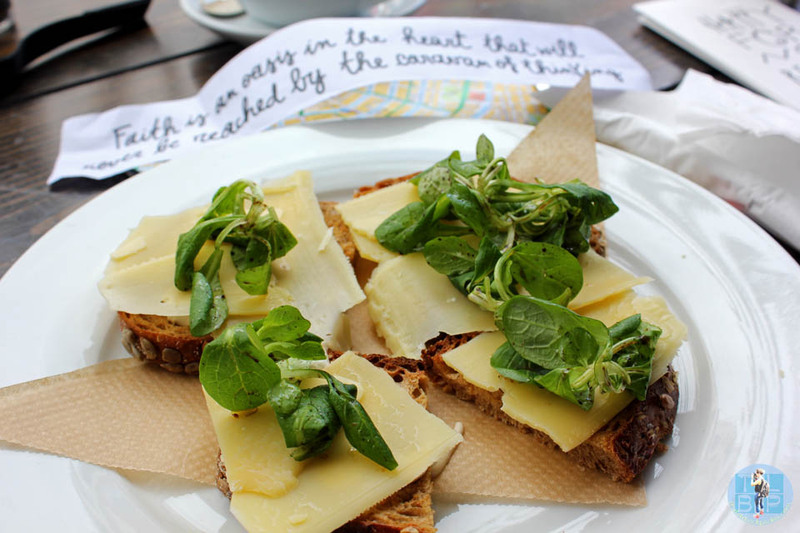 It instantly reminded me of a Melbourne laneway cafe, oh how I miss the cafe culture of Melbourne. The cafe was busy for the majority of lunch, with tables filled mostly by locals, enjoying a Saturday brunch and catching up with the volunteers here. Each dish I spotted being served looked scrumptious and I debated on returning the next day to try another. Unfortunately Trust is located further than I wanted to walk from the central station so I gave it a miss the second time around. It is however quick and easy to reach from central station with a bicycle. The staff were very helpful in explaining how the pay system worked, the different dishes on the menu and spoke very good English. I did however find the service a little slow but I think that has more to do with being a Brit and hating waiting than anything else. Still we had found the perfect seats by the window where we could people watch, sip our coffee and catch up on social media with the free WIFI. So despite the slow service I could have spent several more hours in here. As we left, we paid what we thought, either by cash or card – yes this cafe really are that organised that despite only paying what you think, there is an option to pay by card. 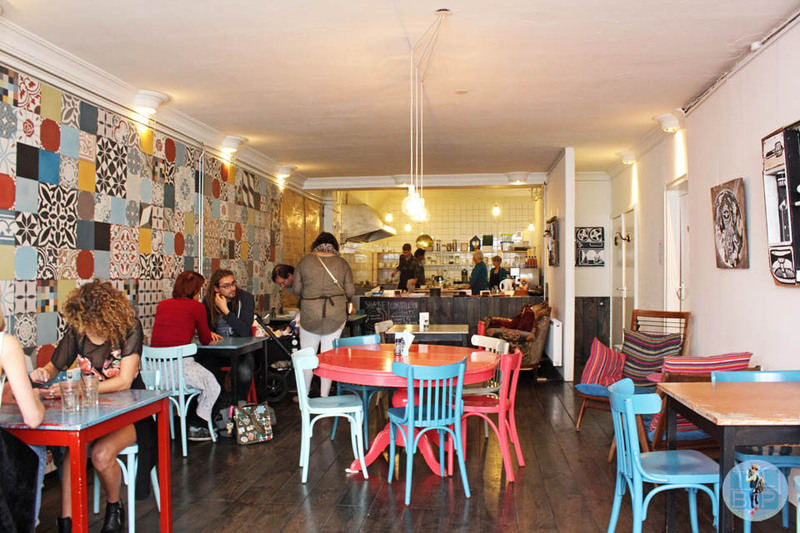 Finding this little cafe tucked away in Amsterdam was a complete surprise and I would never have expected to find such a thriving cafe culture in Amsterdam.